What do you call a sword that's also a shield? No, it's not the set-up to a terrible joke. It's a legitimate question I have after playing a few rounds of BattleCry, the debut game from Bethesda subsidiary BattleCry studios. See, in BattleCry's world gunpowder was outlawed early in the twentieth century after a deadly world war. But humanity being a reckless animal hellbent on its own extinction, we came up with even deadlier versions of medieval-era weaponry. Like a sword that transforms into a shield at will. We really are monsters. Not that BattleCry moralizes your killer instinct. There isn't time. There's been quite a land-grab lately in the "multiplayer-only melee combat" genre. On the relatively realistic side of the spectrum we have Chivalry: Medieval Warfare and War of the Roses. Progressing more to the arcade end of things we have the recently released War of the Vikings. 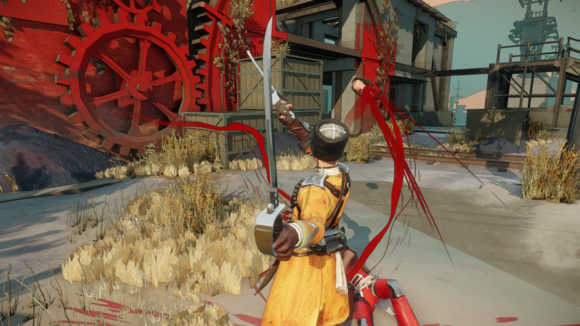 And now Bethesda is making a play into the market with third-person action game BattleCry. 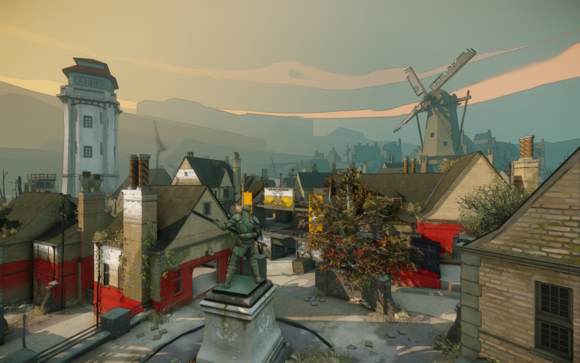 If you'll allow me to compare to a separate genre here—if Chivalry is Call of Duty and War of the Roses is Battlefield, BattleCry is straight-up Team Fortress 2. BattleCry is fast, with little time for thought. It's cartoony. It's pure arcade silliness. The game's classes are all distinctive both in abilities and in silhouette. There's the aforementioned Enforcer, a hulking figure replete with transforming sword, or the much more diminutive Duelist, who can cloak to escape combat situations. You zip around the map at breakneck speeds, leap incredible distances, occasionally grapple through the air from point to point, and then arrive at the battle to swing your sword wildly with about ten other teammates. 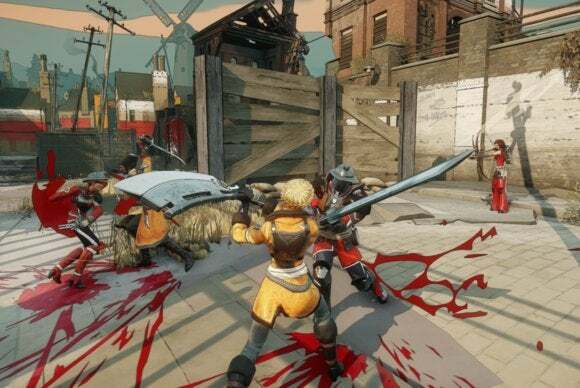 BattleCry falls prey to the same problem as Chivalry and War of the Roses/Vikings in that melee combat is inherently hard to replicate in games, especially in multiplayer. Instead you end up with a rough approximation of what sword fighting is like. In our demo I'd say that skill and strategy mattered far less than which team brought a larger number of players to the fight. If you're on your own, you're probably doomed. If your group of three meets up with a group of five enemies, you're probably doomed. If you're evenly matched...well, then things get interesting. Then, the composition of your group can matter a whole lot. I found the most fun playing the Duelist. Being able to uncloak and stab enemies in the back while they were busy fighting my comrades felt like a definite advantage, and it was more precise than spamming the attack button like the Enforcer class. The Tech Archer was also a lot of fun—here I was kitted out with a bow and throwing knives, which again felt more skill-based. But it's arcadey. These 32-player battles move fast, and there's not a lot of reason to sit still and plan out attacks. You throw your units into the meat grinder and hope your faction comes out on top. What's not arcadey, nor consistent with most free-to-play titles, is the amount of care given to the lore in BattleCry. As I said, the team has a reason for all of the weird weaponry in this vaguely Victorian world. They even have a reason for why it's an arena-combat game—after the last world war, conflicts are now fought by trained competitors in specially-designated "WarZones." 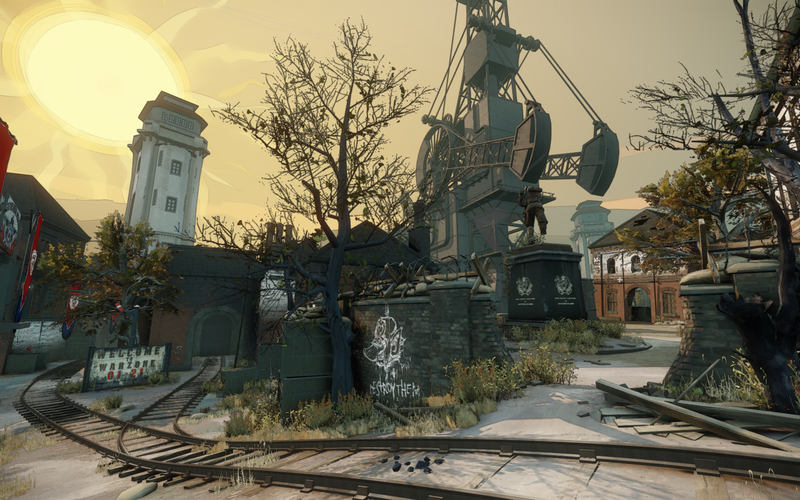 And what's more, the art was directed by Viktor Antonov of Half-Life 2 and Dishonored fame. That latter credit is especially important—BattleCry looks suspiciously like Dishonored's kindred spirit. There's the same pseudo-Victorian setting and cartoony character design, and that is by no means a bad thing. BattleCry is a silly sort of game, and a bit slight at the moment, but it's a joy to look at. In between rounds, for instance, the best players are highlighted in fake newspaper headlines. It's a small touch, but helps build the world a bit more than kicking players back to a generic lobby. There's also an utterly weird mechanic where when a round ends you have a minute or two to sprint around the environment and "salute" the top players from that round, earning extra points for yourself in the process. I don't even know why this exists, but I like it. Salute me, lesser players. There's not a lot to the game yet, but the game's also at least six months from even entering a beta phase, which is slated for 2015. This was but a first taste of the game, and a short one at that. BattleCry will be free, though, so nothing's stopping you from busting out your PC and giving it a shot whenever it releases. You'd better practice your snappiest salute—I'll be looking for it, presumably sometime next year.